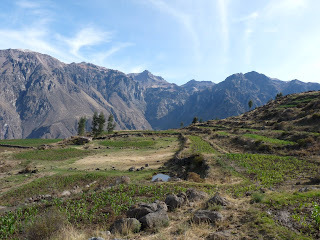 We'd already been walking an hour and still Cabanaconde was in sight behind us. We'd been going up, up, up along the dusty trail, lifting our aching legs, sweating like pigs, gasping for breaths of air. Every step a struggle, every metre a fight. The birds chirped merrily as if taking pleasure from our toils. Chattering among themselves about the crazy gringos voluntarily setting off at six in the morning. Just when we were crawling our way up a particularly steep and ordeous part, we heard some fucker whistling in the distance behind us. Whistling! A happy, carefree tune, totally out of sync with our slogging up the rocky hill. A cowboy on horseback, coming along the road to our right, whistling in total contentment with the world. "He's only whistling 'cos he doesn't have to do any work," I told Jenny. "You don't hear the horse whistling." "Maybe he'll give us a piggy-back," she replied hopefully. Gis a piggy back on yer horse mister. 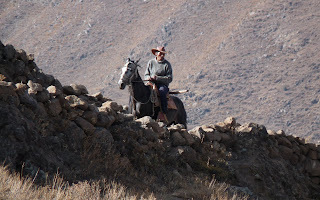 But after stopping briefly to chat, scratching his head at the notion of walking 18 kilometres to Cruz del Condor, he continued on his way, whistling as before as his horse carried him out of sight ahead of us. We took a break, too knackered to talk. 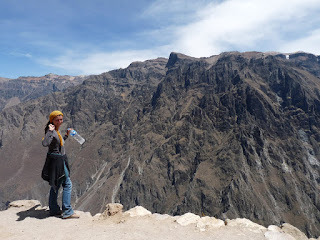 I also had stomach cramps, a side-effect from the third day of altitude (nearly 4km up), or perhaps the vegetable soup which just so happened to have chicken it the night before. 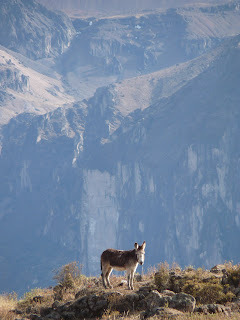 We walked on, continuing along the ridge of Cañón del Condor as we sought to reach our goal. 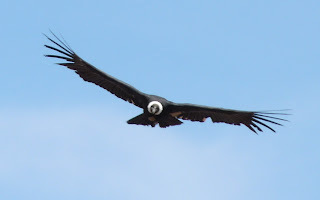 At 7.20 we saw our first condor, wings spread wide as he glided over the canyon valley below us. "Es ist ein bißchen klein für ein Condor," doubted Jenny. 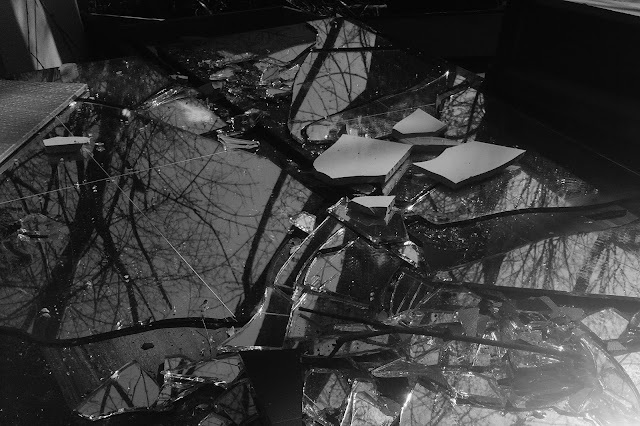 "Klein, weit weg," I replied, as Fr. Ted once told Dougal, although he was talking of cows not condors. Still, the same theory applies. We went on, making wishes to ourselves as we'd been told to do on seeing the first one. The slog was no less hard than before. Twenty minutes later we passed two guys working in a stone-walled field. "¿De donde van?" one of them asked. "Aahh, Cruz del Condor," he replied. He held up a finger. "Una hora." "Mas. 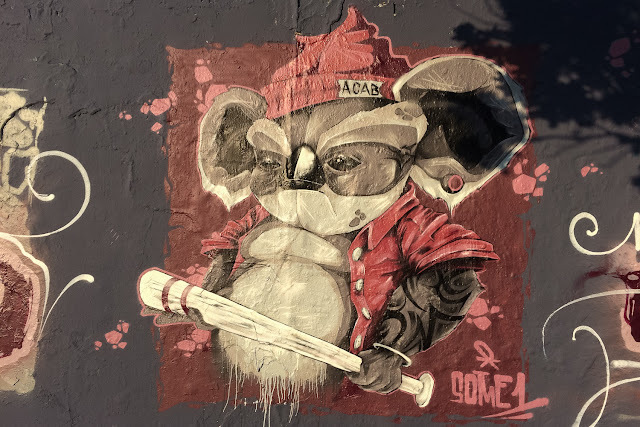 Dos horas." And a big toothless smile broke out on his weathered face as he held up two fingers. Yes, two is certainly more than one. We kept going, traipsing on as before. Half an hour later we saw another condor. "Hat man nur eigentlich ein Wunsch"" Jenny wondered. Evidently a girl with a long wishlist. On we went, on and on. A few more "Buenas Diás" from campesiños in the fields and along the neverending road. It hugged the rim of the canyon, the views only spoiled when the odd vehicle passed choking us in clouds of dust. Fields of miniature cows and donkeys far below, tall trees like modest shrubs in the distance, and still the road went on and on, up and up. We saw a corner in the road up ahead. "Wir können da ein Pause machen," I suggested. Jenny agreed without hesitation. We got there, and it was then we saw the cross. Cruz del Condor! The famed viewpoint for watching condors circled and glide overhead. We'd finally made it! "Wir haben es geschafft!" exclaimed Jenny, delighted the 18km uphill slog was finally over. She plonked herself on the ground, and five minutes later she was asleep. I looked around. Of course, there wasn't a condor anywhere to be seen.